Maximizing Progress: MIT Neurotechnology Ventures ~ Money+Minds! 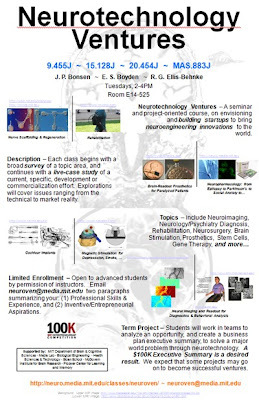 My MIT Media Lab colleague Ed Boyden and I are again co-hosting our Neurotechnology Ventures class this Fall at the Media Lab starting Thursday afternoon 5 September 2013 from 2-4pm. This course is all about envisioning, planning, and building ventures -- both entrepreneurial startups and intrapreneurial product-lines or business units -- to bring neuroengineering innovations to the world. Compelling venture themes include Neuroimaging, Neuromarketing, Neurology/Psychiatry Screening & Diagnosis, Mood & Behavioral Influencing, Rehabilitation, Neurosurgery, Neuropharmacology, Brain Stimulation, Prosthetics, Sensory and Motor Augmentation, Regenerative Neuromedicine, Learning, Memory & Cognitive Influencing, and more.